I’m fairly fond of Drunk Elephant (past mentions). However, I have not tried their sunscreens or soaps. Nor do I plan to. When DE dropped the new Beste jelly cleanser, I thought eh… why not. My experience was consistent with many lackluster reviews, I was not impressed. My skin is normal (I used to think it was combination). In general, I wash my face at least twice a day and do a double cleanse at least once a day. I tried this cleanser on dry skin, wet skin, as an only cleanser, and as a second cleanser. Texture: A little goes a long way, but it felt slippery and stripped my skin of moisture despite having Marula oil and glycerin. Maybe it works better for oilier skin. It does foam up. Packaging: People were extremely upset at the packaging. The bottom lid is concave, you turn it for the center opening to open and squeeze the tube to dispense cleanser. You turn it back and hear a click for it to lock in place. My bottle never leaked but others complained about it leaking. Also, if you leave it in any wet surface in an upright position, that can’t be hygienic. The tube comes in a cardboard box which has an internal black/white print, which leads a gray line on the right side of the tube. Pricing: Drunk Elephant is by no means a wallet-friendly brand. This cleanser is $34 for 5 oz. Compared with the other jelly cleansers you see here, or my favorite non-jelly second cleanser (Cerave Foaming Facial Cleanser), this cleanser is not worth keeping and already returned to Sephora. Reviews of the other two cleansers. Both have hyaluronic acid, which is hydrating. Glossier Milky Jelly Cleanser. Thicker texture. I like it on wet skin. Nice packaging and it comes with stickers for customization. It has a smell – like a mild floral scent of a plastic toy from childhood – but it’s actually from rosewater. This is probably the only Glossier product I like aside from the lip balms. It’s slightly pricier than the next cleanser, but since it’s a thicker cleanser, you will have to use more to properly cleanse. I like trying new cleansers so most likely won’t rebuy. Referral link: 10% off first purchase. Lagom Cellup Gel to Water cleanser. 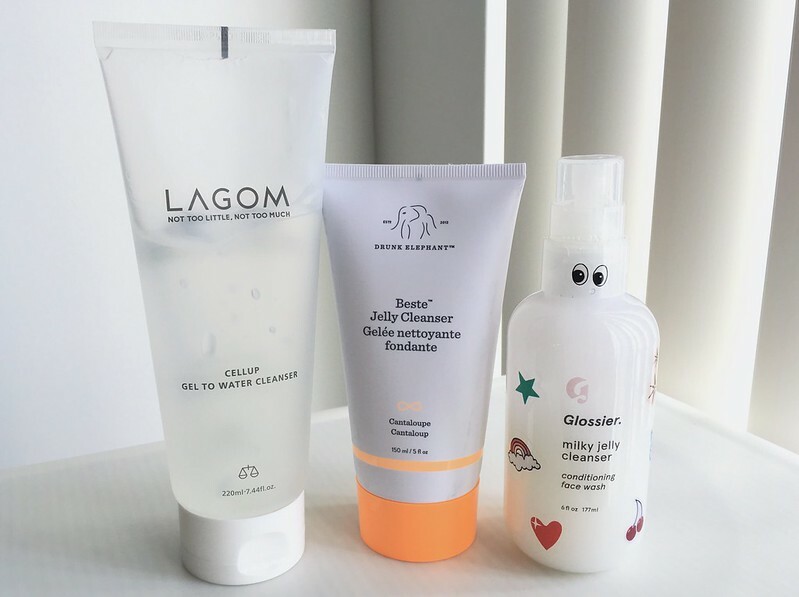 Lagom is a Korean brand. Gel = jelly. This cleanser is great — if you wanted a jelly cleanser in concept, this is the one to try. It does not strip at all. In fact, I think it’s super moisturizing*. I love how the gel dissolves into a watery consistency once you swipe it. Similar to the Beste, a little bit goes a long way. I would have be impressed if DE formulated a product like this. (*You will never get enough moisture from a cleanser — you still need actual moisturizer.) It’s also a large tube — at 7.44 fl oz for $17, the cost per oz is almost 1/3 of the Beste cleanser. Find it at Target and Peach & Lily (referral link: $10 off $50 for first purchase). This bottle is lasting me for a while since I rotate cleansers regularly. If I had to decide right now whether I would rebuy one day, I would say yes. oh darn! thanks for using!